It's mind boggling how we live what was science fiction when we were kids (guessing my age now? )- paying for things without physical money? First we got debit and credit cards to slowly replace cash. Now paying for things with your mobile phone? It's amazing how fast payment technology has progressed in the last 20yrs. What's next? Maybe when my kids have kids you can go to a coffee place and 'think real hard' and squint your eyes and send brainwaves into the store's future merchant account terminal. Below is an excerpt from a post about mobile payments. If Google is moving into this arena, then you can bet it's going to be a big deal in the near future. Mobile payments is not some fad that is going away. Cellphones are cheaper and better each year and everyone has their phone with them so it makes sense to buy things as you live your life with your cellphone. We can eventually buy and sell with friends and co-workers for little things as this technology evolves. Buying from a non business with your phone- how cool is that? Businesses that are mobile in nature like restaurant deliveries, on the road sales persons or on the road home improvement contractors are going to love the low cost and convenience of accepting payments anywhere their cellphones get coverage. 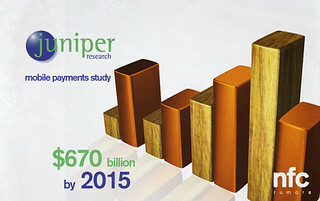 Mobile payments are going to skyrocket to $670 billion dollars a year by 2015 according to this Juniper graph! The above tweet has an interesting article linked to it about mobile payments and what companies are doing to capture this booming industry. If it looks cheaper, then is it really cheaper? Transparency (as you’ll see in this example), Track Record (do they have any Happy Customers?) and Competitive Pricing (fair, not rock bottom) are the three most important things to look at when looking for Merchant Services for your business. Here’s a great example to illustrate what Point of Sale Companies are leaving out of their quotes to appear ‘CHEAPER’. Name is changed in this example. “Ms. Smith, I appreciate what you are saying, however, I’ve been talking to thousands of Business Owners just like yourself for over 6yrs (yes, I am biased). I’ve seen everyone’s numbers regardless of volume or business model. Credit card acceptance is essential in this economy for any Small Business Owner. Just consider these ideas below. Is it Possible to Get a Rate of 1.37% or 1.42%? Lately, Aug/ Sept 2009, I’ve been getting a lot of Business Owners say that they are being offered 1.37% or 1.42% for a qualified rate for payment processing. First, I’d like to refer you to the last Blog Post that I wrote on Visa and Mastercard’s Wholesale Pricing to the Six Credit Card Processors in Canada. The gist of that post is that if the rate that you’re being offered is LOWER than the publicly posted Wholesale Pricing by Visa, then the company that is offering this fantastic deal is probably going to make up for it in other fees or will change this deal on you as soon as you penn your autograph to their multi-year contract. Just type into your Google search bar “visa canada interchange rates”. After 5mins of poking around, you’ll eventually come to their public, online PDF of their basic interchange rates. The most simple way to understand what interchange is in regard to payment processing, without getting into the complexities of how the money flows or who issues the credit cards, etc., is to look at these rates as if they are wholesale pricing or buyrates From Visa to the Six Credit Card Processors in Canada. This article, 7 Lame Reasons Why People Spend More Than They Make is a good example of why credit card acceptance is important for your business because of people’s spending habits. Most Consumers spend more than they make and want things that they shouldn’t be spending money on. In this day and age, businesses that don’t have bank or credit card acceptance will not have as much volume as a competitor’s business who does. It’s not worth trying to save a few hundred a month for a processing service to lose out on thousands of dollars in increased sales. Besides, with a good accountant, who understands business tax deductions, you won’t lose your cash, just your monthly cashflow for the amount of the processing service that you use. How Do Credit Card Transactions Work? The payment processing industry is very confusing that most Business Owners don’t understand how a credit card transaction works, who’s involved and how does the money flow when a Customer purchases a product or service at their Business. Here is a concise article on The Terminated Merchant File Match List . It explains how Business Owners get on and How To stay off this list. This is the one list besides Santa’s Naughty List that you do NOT want to be on in regards to Credit Card Processors and payment processing and acceptance of credit cards for any business storefront or online that you may want to start in the future. This list is shared among the Six Credit Card Processors in Canada. Do You Really Want the Cheapest Terminal? If you don’t care about long term PAIN and just wanted the short-term ‘gain’ or savings, then DON’T READ THIS POST about payment processing! What is the True Cost of Merchant Accounts compared to chasing Customers for cheques? This is a great article by Michael Guerin from www.ampyourcashflow.com, a US provider. Here is an article that explains why Credit Cards offer Consumers more protection in buying products that have a lag time to get delivered from time of payment. If you have a new potential Customer that understands how their credit card protects them when they purchase products and services, then you need to accept credit cards in your business in order not to lose sales. Why Does My Credit Matter When Getting a Merchant Account? When I was sending an email to a Business Owner today letting him know about our new Referral Partners Program, he sent me this reply below after I clarified how the program works. He brought up a good point about getting a Merchant Account. Do You Need PayPal for Website? Here’s a great article to help you understand the difference between PayPal VS Merchant Account. “Better Business Bureau (BBB) announces the Top Ten Scams of 2008 and simple consumer tips to protect yourself from becoming a victim in the coming New Year.” from the Ottawa Citizen. If you are a retail storefront business with low margins, then please read about and do NOT do these 3 THINGS in order to avoid the fees that you pay to be able to accept credit cards. They are definite no-no’s that Credit Card Processors frown upon. How can you protect yourself against debit card fraud? What should you do if you are a victim of debit card fraud? When would you be liable for losses? There are dozens of articles available on the topic of Chargebacks, however, none as definitive as this one. This article gives you the usual reasons why your customers will dispute their credit card charges and what to do to protect yourself. This is an honour and privilege to have a Guest Post by Michael Guerin, a recognised expert in two industries that help business owners. The Search Engine Optimization/ Online Marketing Industry and in the US Payment Processing Industry. What are the 10 Things that Credit Card Payment Processors consider when you apply for a Merchant Account? 2 Any late or missed payments on bills/ debts. What’s the frequency of these actions? 3 Any large amounts of consumer debt? Over extended? By Dec.31, 2015, every business in Canada will be required to ONLY accept CHIP based debit & credit cards. Banks are already starting to switch over cards that need to be replaced, and handing out these types of cards to new accounts holders. In this tough economy every penny counts, so it is upsetting to most that Credit Card Processors operating in Canada have and are making changes that increase your costs of processing credit cards. 9 Predictions for Credit Cards in 2009 is an SCARY but TRUE article about what card issuers are going to do to card carriers as this economy keeps tumbling. The challenges of fraud compound when we see how much Canadians love using their debit cards. The Toronto Sun has reported almost 16 million transactions on Dec. 23, 2008 alone. Knowledge of some debit fraud prevention can help if more people knew about them- Check out this article on 10 ways to prevent debit card fraud. Who is Liable for Credit Card Fraud? YOU. Credit Card Fraud can affect your business and you need to be prepared to deal with it. Here are some fraud prevention tips. Gift Cards Make Money All Year! Gift Cards are being used like crazy by retailers and consumers. Should you add it to your businsss? Here are the reasons why gift cards and loyalty programs will make you more money if you are a retail business. Breaking Credit Card Processing News that Applies to You!!! Below are two great articles that are very important for Canadian Business Owners who use credit card processing for their businesses. Who’s really paying for the high end corporate rewards cards? What can a group of business owners do together against rising credit card fees? Online Business Trends That WILL Affect Your Business! It’s 2008 and your potential customers are not the same as just a few years ago. They have Google and cellphones that have internet access. They are smarter and have quick access to dozens of choices for any particular product or service. Making a business’ fight for attention tougher and tougher. Here’s a great article for entrepreneurs that is an alternative to the gloom & doom, fear spreading news that surrounds us right now. Here’s a second inspiring article. May you have great rewards from your all your hard efforts to understand your customers and offer them superior products and services! What It Means To You When Credit Card Usage INCREASES? As Large Retailers start issueing more and more debit & credit cards, then it drives spending with payment cards at your business, making card acceptance essential in surviving. And lower fees essential to keeping your money after you make it. Here’s an article that highlights some issues of concern for Canadian business owners in regards to debit and credit card processing fees. Here’s a good article on credit card processing in Canada in regards to escalating rates and fees! A great article that every Canadian business owner that has a traditional retail storefront business model needs to know in regards to payment processing for their business. Debit Processing COSTS will SKYROCKET soon! This is an article that sheds some light on why debit transaction fees will SKYROCKET for small business owners in the very near future.This is a part 2 explanation of what is to come for Canadian business owners in regards to debit processing costs. Watch Out for ONE PAGE Contracts! There are some companies now that have 1-2 page contracts that are SIMPLE and NON-THREATENING. Here’s some great info on understanding terminology in regards to merchant accounts. Other names for the service to Businesses so that they can accept and process credit cards from their Customers in order for the Customers to purchase the businesses’ product or service: Merchant Services, Payment Processing, Merchant Processing, or Payment Acceptance, but Merchant Accounts is the most widely used term. Here’s a great article on the difference between Dial-Up, IP (Internet Protocol) and Wireless terminals. I couldn’t say it better than this, so I won’t. Every payment processing company has a range of products to suite different businesses. From debit machines, to credit card machines, to IP terminals, to Wireless terminals that are not Cellular/GPRS, to GPRS Cellular (wireless) terminals for debit only or w credit card processing, to E-Commerce credit card processing, to PC & Internet processing from any computer, to phone authorisation processing from any phone. You know as a business owner and especially as a consumer that not every single one company can have the best in services and pricing for every single product offering. Is Surcharging Customers to Use Debit a Wise Decision? Here is a great article on the pros and cons of surcharging. What’s the Difference: Debit, Credit and Charge Cards? Here’s a great LINK for you to explain what debit, charge and credit cards exactly are. After reading this, you’ll understand from a consumer standpoint what each card type is, and this will help you as a business owner understand when and why a customer will use each type at your business. Since we are all card carriers these days, we also intuitively know at what price ranges and what products we would use any type. Here’s an article on security measures that will fight against rampant debit and credit card fraud in Canada. I have had the privilege of having two incredible friends over the last decade plus. These two men are intelligent, honourable, and are always willing to take personal inventory in order to improve themselves. We share our daily faith, life, family, work, business, thoughts and experiences. We share each other’s dealings with different people, learning from them, and we love to bounce every thought, new knowledge or experience inquired or acquired off of each other.